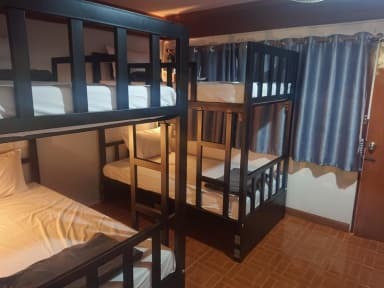 Blanco Hideout Railay kohteessa Krabi, Thaimaa: Varaa nyt! A fun and sociable hostel located on Railay East with a panoramic view over the beach and surrounding mountains. Featuring a pool, two bars, restaurant and common areas for sunbathing and socialising. Blanco is the only hostel in Railay so it's easy to meet fellow backpackers. All of our rooms are air conditioned. Free wifi throughout the property. Blanco Hideout Railay is a resort style hostel. Each of our 4, 6, 8 bed rooms are all surrounding our pool and garden area. Our pool bar closes at 10pm so a good nights sleep isn't an issue. Our 10 bed dorm with ensuite is located next to the restaurant/reception area. All of our luxurious ensuite dorms are equipped with A/C, showers and toilets, power sockets, reading lights and massive lockers for each of the beds. We provide towels and a proper comfy duvet for free. Every week at Blanco Hideout! Railay Pub Crawl - Starts at Blanco every Monday, Wednesday and Friday, with 100 minutes of open bar at our pool from 8pm - 9:40pm. We then take you to 3 of the coolest bars In Railay with free shots along the way and a free singlet. A great way to get to know your fellow guests. Start the night off by joining in our delicious buffet dinner. Blanco Boat Party - Every Tuesday and Saturday. If you have been on our Boat Party in Phi Phi you know the drill... Unlimited booze, live DJ, buffet dinner, snorkelling and unreal scenary! The only way to see the surrounding islands of Chicken, Poda and Tub. Pool Party every Sunday! Live DJ and awesome drink specials! Railay is also famous for it's white beaches and insane rock climbing and we have many different rock climbing packages to chose from with the most experience guides that are licensed and insured. Our staff know all the inside info so be sure to ask us at reception for all the best beaches, viewpoints, jungle treks, kayaking and other cool things to do in Railay. ATM's, mini marts are all within walking distance of our hostel. Please note Passports are taken as deposit during your stay. 7. Reception working hours 08:00-20:00.